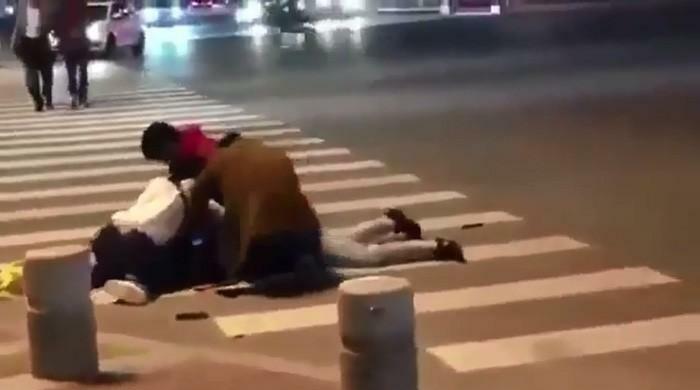 ISLAMABAD: A viral video which is being circulated on internet showing a man being beaten by three people in China is not of Pakistani student Usama Ahmad Khan as claimed by many social media users. In a statement, the Foreign Office spokeman clarified that the video is fake and has nothing to do with Pakistani studnet, who actually committed suicide in Shenyang city in China's Liaoning province. He was a student of Shenyang Jianzhu University. "There is a need to respect sensitivity and privacy, especially of the bereaved family. We request all to help us in exercising caution in such matters, avoiding sensationalism and stopping spreading of "fake news", the FO stressed. "Upon receipt of information, the Ambassador of Pakistan to China deputed an officer of the Embassy to visit Shenyang. In Shenyang, he met students and faculty of the University, as well as, the police authorities. Throughout this process, he remained in close contact with the family of the deceased and got full support of Chinese authorities." In close coordination with the family, the Mission will send the dead body to Pakistan. The body was transported from Liaoning province to Beijing in the morning of 17 November, 2018. All arrangements are now in place for transportation of the dead body to Pakistan tonight.